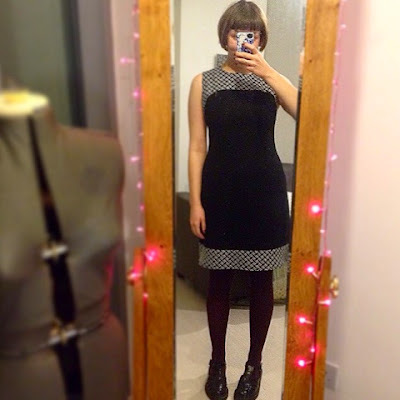 I used a lovely black wool with 2% stretch as my main fabric. I always find it a struggle to get plain black fabric that looks really good in quality, but this was a decent find from Leeds Kirkgate Market. The contrast bands were cut on the bias from some remnants of John Lewis sale fabric. 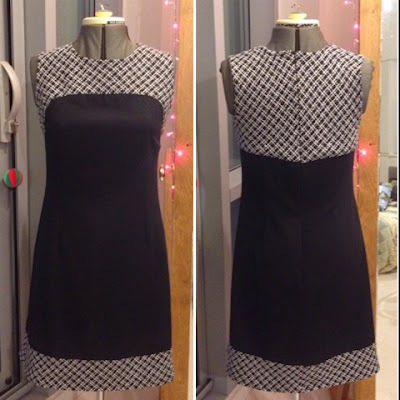 I love the simplicity of the dress, and I think using slightly more expensive/better quality fabrics than usual really adds to the finish of the garment. I didn't escape a few fit issues. 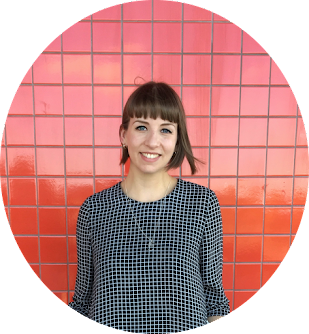 Because the patterns span such a wide range of sizes, there are quite big jumps from one size to the next (the introductory section does advise that your measurements might fall between sizes). As the Mary shift is designed to be fairly loose, I went for the size that would fit my bust - and it really did, I'm so pleased! 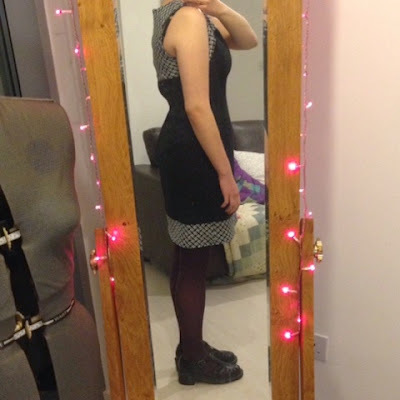 This meant that I did have to take in the side seams a little at the waist and hips to get a better fit for me. Obviously I could have just graded the pattern when cutting, but I always like to cut that little extra, just in case. The bit I stumbled on a little was the fit at the back, and I'd say this is mainly due to my inexperience of working with bias-cut fabric. I interfaced the front contrast band, but for some reason, I decided not to do the back pieces. This meant that the shape of the back pieces got a bit distorted when I was working with them, and particularly when the zip was inserted - it went all wiggly at the centre back, nooooo! Not exactly how you're meant to do it, but in a salvage attempt, I interfaced the back contrast pieces AFTER construction, just so they would keep some sort of shape and have the same weight/stiffness as the front. This was a vast improvement, but you can see a bit of gaping at the arms and a bump in the centre back on the picture above. Despite the issues in the back, I really like the dress, and plan to wear it lots (most likely with a cardigan in the office). 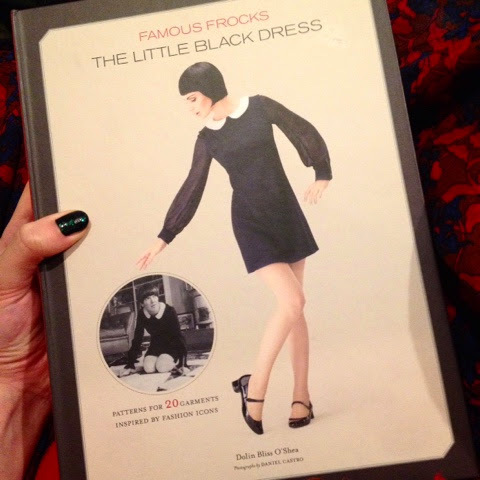 I thoroughly recommend Famous Frocks too. The garments all have a vintage feel to them, whilst still being incredibly wearable. The introductory part of the book, dedicated to sewing techniques and tutorials, is fab. It's a bit less visual than some, but the explanations are more than enough - I did my first all in one facing with ease by following the instructions offered. 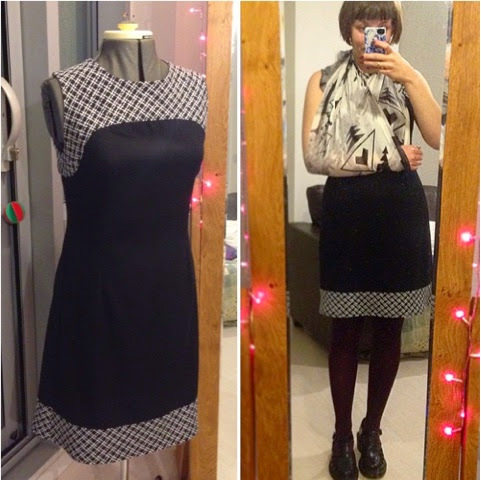 There are a few really good opportunities to work with stretch fabric in the book too, and I need a bit of practice, so I have my eye on the Liza Minnelli inspired wrap dress next! Has anyone else sewn anything from Famous Frocks? Ooo! Your dress is lovely. I have read only good things about this book, so I might have to put it on the shopping list! I hope your arm gets better soon. I hate ice, and am always afraid that I will slip on it, but I love how you've coordinated your sling!